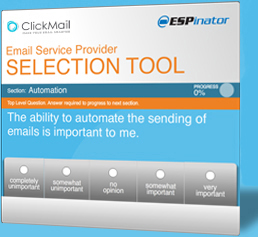 The ESPinator was built and is maintained by Clickmail Marketing. ClickMail Marketing is an email consultancy and value-added reseller of over a dozen email service providers. As one of the fastest growing email solutions providers in the industry, we strive to stay vendor neutral so that we can recommend the best solution for your specific marketing needs.